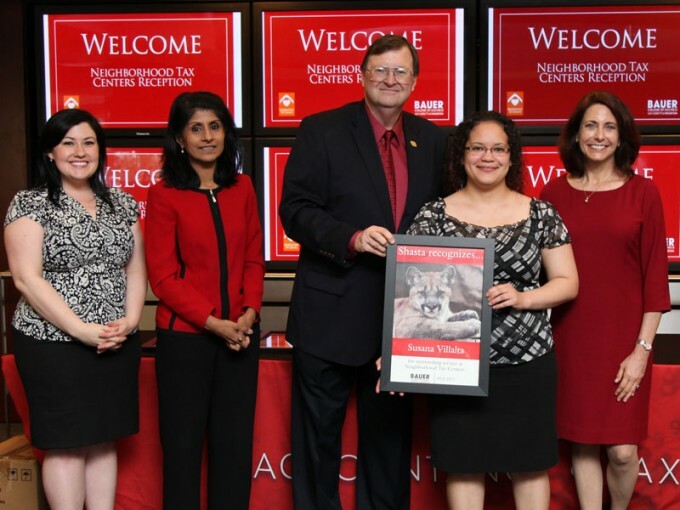 On Nov. 1, Neighborhood Tax Centers hosted a reception to recognize the outstanding efforts of the 121 student volunteers at the C. T. Bauer College of Business at the University of Houston. The students volunteered 3,875 hours of their time to prepare 4,705 tax returns. Their efforts resulted in tax refunds totaling $7,899,360. From outstanding academic achievements to national case competitions, accounting students at the C. T. Bauer College of Business at the University of Houston succeed inside and outside the classroom. In addition to using their knowledge for academic and professional success, one group of students also uses their skills to give back to the Houston community. This year, 121 Bauer College students volunteered their time with Houston’s Neighborhood Tax Centers to provide free income tax preparation for families earning an average of $20,000 per year. The students volunteered 3,875 hours of their time to prepare 4,705 tax returns. Their efforts resulted in tax refunds totaling $7,899,360. Lauren Duplessis, volunteer and training manager for Neighborhood Tax Centers, credited the Bauer students’ service to helping Houston’s Neighborhood Tax Centers become the number one center in the state of Texas. On Nov. 1, Neighborhood Tax Centers hosted a reception to recognize the outstanding efforts of the Bauer College volunteers. As Dean Latha Ramchand accepted the plaque on behalf of Bauer College from the Neighborhood Tax Centers, she asked students to share their thoughts on their volunteer experience. Many of the students had previously volunteered with the Neighborhood Tax Centers and chose to return again this year, they said, because they benefitted from helping these families. Bauer College also benefits from the relationship with Neighborhood Tax Centers. Neighborhood Tax Centers will be hosting volunteer training sessions on the University of Houston campus in UCBB 330 this month. To find out more information about how to get involved, contact Lauren Duplessis at lduplessis@Neighborhood-Centers.org. No, doubt that it was a great learning process for the student. And thanks to Houston’s Neighborhood Tax Centers for providing free income tax preparation for families earning an average of $20,000 per year.